Learn about the temperament and personality of the Shiba Inu. Discover what he's like to live with, his traits and characteristics and how he generally behaves. And look at lots of Shiba Inu photos. 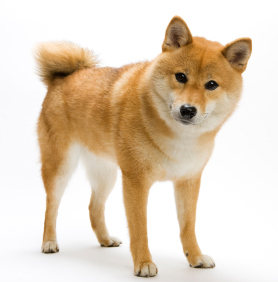 The Shiba Inu is a unique breed. Intelligent, active, energetic, they think pretty highly of themselves. They are famous for their spirited boldness and independent nature. If you are not careful, they will train you. Early obedience training is important, but even then, Shibas don't really enjoy being obedient. Off leash work is especially challenging and the recall might require a miracle. They love to run and they love to run away. They are escape artists and owners must be careful every single time they open a door because they will bolt. Some can even climb chain link fences. Shibas have been known to disappear for days at a time. They will hunt mice, squirrels, and other small animals if they can. Shibas need regular exercise but a spirited 30 minute walk each day should suffice. They are good watchdogs and only bark when there is a reason. They are reserved toward strangers. They tend to be aggressive toward other dogs, and can coexist peacefully with cats, but if a cat runs away, there's a good chance the Shiba will chase it. Shibas will do well with older, well-behaved children, but some are afraid of young children and alarmed by their squeals and quick movements. Many Shibas will run and hide from toddlers. If the toddler pursues the dog, it could easily result in a fear-biting incident. While a Shiba can be sweet, you will earn whatever affection you get. They are not lapdogs and prefer to sit beside you, not on you. They are not particularly cuddly and don't really like to be held. They spend a lot of time on their own, enjoying some quiet solitude. Because they don't really like to be touched or handled, grooming can be a real challenge. They are generally quiet, but do possess the Shiba scream -- a high-pitched banshee call. They let this scream go whenever they are unhappy, and it can be a bit embarrassing. They can be a bit of a drama queen. But despite all of the breed's idiosyncrasies, Shiba owners will tell you they are the best breed in the world: funny, loyal, playful and fast to housetrain. So if you want a dog who thinks he's smarter than you, and will try to push your buttons, then you might consider the beautiful, athletic, energetic Shiba. The Shiba Inu is moderately easy to train. He learns new commands at the average rate. He is neither difficult nor easy to train. The Shiba Inu is a very heavy shedder. He sheds an awful lot of hair! You'll find hair all over your home, stuck to everything! You'll probably even find it in the butter!